ChickenVeyors were developed by Kice decades ago. The concept was ahead of its time. Performance was handicapped by the small capacity of the old wood and plastic coops, then used almost universally, and the wasted effort and time involved stacking and unstacking them. At the time, Kice built only a few prototype machines which provided the basic ideas, but the project was put on hold pending industry acceptance of modular cages. It turned out the delay was a good thing. 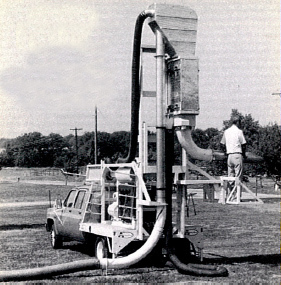 It provided time to experience with the early prototypes, each improved over the previous machine. The product received vigorous testing in the field. Millions of chickens were loaded under every variety of climate and geography regions. This extensive testing also exposed problems with the existing modular metal cages, despite being a great advance over the wood and plastic coops. The testing showed the system needed: more structural strength and rigidity; less weight, more but smaller compartments; materials and design to reduce maintenance. All of these improvements led to the Kice ChickenTainers, which proved to be the perfect complement for the ChickenVeyors. ChickenTainers looked much like other modular cages at the time. Their overall dimensions were identical so that you could replace any old broken-down cages with the new “super-sturdy” cages. They could be stacked together and unloaded the same as the old cages. But there were important advantages that could save customers money and improve operations. Perhaps the biggest benefit was the triple-tier arrangement, that was given at no extra charge. Standardization resulted in manufacturing economies that paid for the extra doors, etc., so the benefits were free. Besides reducing chicken bruising, this 15-door arrangement gave the customer two center posts and shorter doors – obviously stronger than the single center post cages with doors almost 4 feet long at that time. The exclusive, patented design utilized aircraft structural techniques which provided more strength with less weight. For example, the grille rods contributed to the structural strength of the cage by the way they were joined to the frame members. Other competitive designs at the time had the grills serve only to fill up their openings. Perhaps the biggest advantage of the ChickenTainer was the versatility of the pallet-type base which permitted fork truck pickup from either side as well as either end. ChickenTainers could thus be loaded on a truck cross-wise wise like other competitive cages, or they could be loaded length wise in a double row so that all doors were accessible. This was important because the accessible doors permitted filling ChickenTainers without removing them from the truck and without restacking them. Being birds, it took surprisingly little vacuum to move chickens thru Kice’s smooth plastic tubes. They could be moved quickly. Furthermore, the chickens were protected by their feathers and had quick reflexes. In the tube, they traveled right side up, feet down, head up. The outlet fitting reduced the air velocity still further, so the chickens were coasting slowly when discharged into the cages. The conveying was very gentle and compared favorably with the hand-carry method. 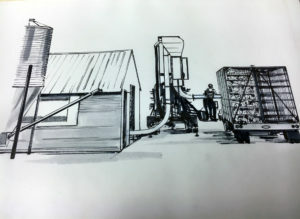 Handling chickens with the ChickenVeyor was extremely simple compared to other mechanical handling systems. 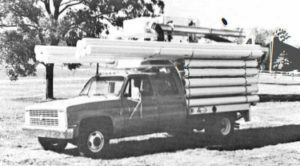 In operation, the entire crew of 5 or 6 people, plus 400 ft. of 8” diameter plastic tube, fittings, manlift and the engine driven air unit would arrive at the job site in a single truck. On arrival, each crew person had an assigned set-up job. Working as a team, they were ready to catch chickens in 4 to 5 minutes. Two of the crew members distributed the tube sections into the house, connecting the first several sections together with the hopper ready to receive the chickens in the front part of the house. The other members started the ChickenVeyor engine and hydraulically raised the manlift tower to its vertical position, locking it in place. Hydraulic feet stabilized the rear end of the truck, spreading the load. The manlift platform and railing were unfolded; the tube was connected to the tower telescope, and the engine speed was increased. Now they were ready to haul the chickens, assuming the cage truck had arrived and was pulled in place alongside the ChickenVeyor. The system handled broilers, pullets and spent hens equally well, and could carry them 400 feet (quantity of tube carried on the standard racks) or more. Some of the tube lengths were flexible. A typical crew included an operator and a coordinator. Three or four crew members served as the catching team in the house. Typically, with a three-person team, each catcher picked up eight birds at a time (four in each hand) carried them a short distance (average three steps), dropped them into the hopper, then returned to pick up eight more birds. With a four-person team, each catcher carried six birds. In either case, the total was 24 birds per cycle, which filled one compartment in a cage. Naturally, there was a brief period between each cycle. This interval signaled the operator to move the discharge fitting to the next cage compartment. 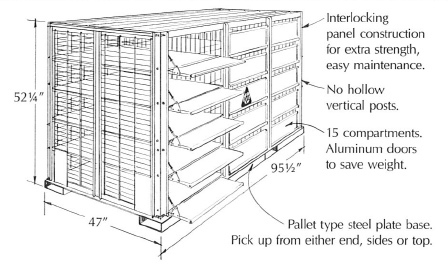 The number of birds per compartment could vary, but 24 worked well, totaling 360 birds in each “15- hole” ChickenTainer. An experienced team of three catchers could easily move about 60-70 broilers per minute, four catchers proportionally more, 80-90. The design capacity of the machines was more than 120 four-pound birds per minute (7200 per hour), but the crew could not maintain this rate. However, a loading rate of 4,000 to 5,000 birds per hour per machine was a reasonable assumption, depending on the crew’s experience. 8,000 to 10,000 birds per hour could be achieved by a larger crew with two ChickenVeyors that loaded both sides of the cage trucks simultaneously. The chickens tended to be “vacuum-cleaned” during their trip through the tube. The system carried this dirt, dust and loose feathers to a cyclone and filter bag, so the air discharged into the cages with the chickens was clean. Recognizing the specialized nature of the poultry industry and the special problems of their live-haul departments at the time, Kice put a strong emphasis in designing the most advanced live haul equipment products.